The island of Barra offers many typical Outer Hebridean themes: strong Gaelic identity, sense of heritage, plus amazing beaches - take a short trip to Vatersay at least. Hope for sun though. And, yes, it's the island where the plane lands on the ebach. Castlebay is the main centre on the island of Barra, down at the southern end of the Outer Hebrides. These islands on the western rim of Scotland end like a chain shedding links. At the bottom end – the south end – from South Uist, a causeway leads to tiny Eriskay, then it’s 40 minutes on the ferry to Barra, in turn joined by a causeway to another tiny island: Vatersay. After that, well, there are other bare and rocky outcroppings – of which the best-known is Mingulay, thanks to a song – but none occupied these days. So Barra is the full stop on the island sentence. It’s kinda round like a full stop or period as well. What’s it got? Well, that all depends on whether or not the sun shines. If you waken up on the first morning and look out to a perfect reflection of Kisimul Castle in the bay and the sky is blue, then get that breakfast over and done with quickly. There are beaches to see, sands to stroll on, views to admire. (Above) This is Traigh Eais, which is definitely not Gaelic for ‘the beach at the back of the airport’. Nevertheless, that’s where it is. And there are plenty more. If it’s raining then, I suppose, you could visit Kisimul Castle. Ho-hum. (By the way, ho-hums on this website are never a very encouraging noise.) Or take in Barra Heritage and Cultural Centre. Or…watch the plane land on the beach…or…well, just wait around till the rain stops. Drive round the island perhaps. It won’t take you long. Cyclists should check the wind direction first. Here are some pictures of Barra in the sunshine. I thought I was going to get some kind of snow-blindness, so white were the sands. There is a ‘Three Beaches” walk on adjoining Vatersay but you may be beguiled on any one of them just to sit slack-jawed, listening to the water and the cries of seabirds. There will be no other sound. Many of Barra’s beaches are only seconds from a parking place, should you be of a particularly indolent disposition. There is archaeology too; ancient religious sites…piles of significant stones of various sorts. There is a deserted village (Balnabodach) reiterating the prevailing Hebridean theme of desertion, depopulation and/or wicked forced clearance. Colonel Gordon of Cluny is an infamous name around here. Many of these themes can be explored at the heritage centre, Dualchas, in Castlebay. (Pictured) Castlebay from the Vatersay Road. Could I get a picture with the sun on the houses? Nope - though the sun shone on Vatersay just minutes later. (See below.) But at least it shows there is a castle and a bay. As for refreshments and accommodation, there is of course a choice of bed and breakfasts and self-catering places. We ate at the Castlebay Hotel. Delicious soups, disappointing main courses. Choose carefully. And we only got our beer in the pub part of the hotel after the barman had finished his cigarette and detached himself from a bunch of lads standing outside in the evening sunshine. But, hey, it was a nice beer and worth waiting for. Oh, and the Barra Airport cafe does a perfectly acceptable coffee. In Castlebay, the Hebridean Toffee Company used to do really lovely flaked smoked salmon sandwiches. (I’d written about that on the Eriskay page and just changed it!) Now they don’t. Sorry. They still do coffee and sweet stuff though, as their name suggests. Castlebay has (as we have pretty firmly established by now) a castle in the bay. Johanna visited. Kisimul Castle is in the care of Historic Environment Scotland, our government agency charged with stopping very old historic things from falling down totally. Usually they are very good on interpretation, but Johanna returned disappointed from this castle experience. Kisimul Castle has little interpretation in its sparse rooms. Your £5.50 (2014) also buys you a walk round the ramparts, ho-hum, and a wee circuit by boat of the rocky islet on which the fortress sits. The boatman seems of a taciturn disposition plus the whole experience only takes about half an hour. (Pictured) Oystercatcher (right) with thrift (left). Common all around the Scottish coasts, the oystercatcher’s piping call reaches a peak of hysteria during the breeding season. The thrift plant meanwhile, used to appear on old threepenny bits but (if you are from the UK) most of you won’t remember that anyway. But it’s a characteristic coastal plant. Anyway, after this wholly uncharacteristic Historic Environment Scotland offering, Johanna was doubly disappointed when she learned that I had been sitting in the sunshine on the rocks near the dunes at Tangasdale – just a couple of minutes drive from Castlebay – and had seen an otter. I missed the photo and had to make do with an oystercatcher and some thrift though. I hope you’ll make do with it as well. Memorial to wartime Catalina flying-boat crash. Wreckage next to memorial. Vatersay. Meanwhile, there is another theme, possibly not always noticed, that runs through Barra and up into the rest of the Outer Hebrides. We were reminded of it on the road to Vatersay – a gully full of aluminium spars and sheeting. The broken metal was once a Catalina, a wartime flying boat. A very dignified little memorial records the tragic loss of some of the crew when the plane crashed nearby. Even more poignantly, there was a little wreath at its base, left by the family of one of the crash survivors. He lived till 2011. His comrades died in 1944. 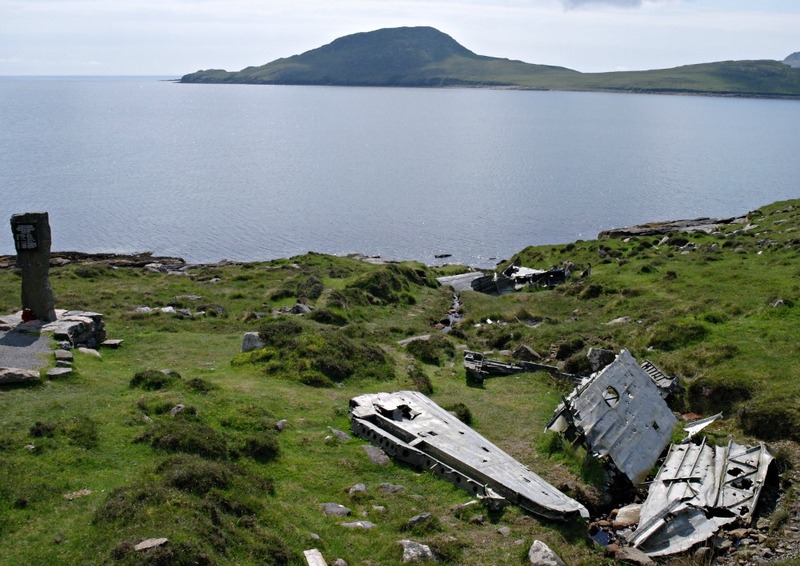 On the same topic, though the localities are mentioned on other pages on this site, when you get to Eriskay, take a look at the local kirkyard (just by the pub) and the sad little row in the corner of unidentified Merchant Navy graves. Or visit the ancient churchyard of Nunton on Benbecula, where – amongst others – three Australian servicemen have their last resting place after their aircraft came down short of the runway at RAF Benbecula. It’s very sobering to find Commonwealth War Graves in such a seemingly remote rural setting. Just a reminder that these islands face the open Atlantic and had an important role to play in the WWII Battle of the Atlantic and the containment of the menace of the German U-boats. Barra, like the rest of the Outer Hebrides, is a very good place for otters. Pictured here is a Twin Otter that has just landed on the beach, or airport, as it is called on Barra. So, overall, should you go to Barra? If you are outdoorsy, then, yes, probably. You might find better dining than we did on our last trip. You might get that great shot of the otter. (Wait on the rocks west of the bay at Tangasdale, a few minutues NNW of Castlebay – fine walk here towards Doirlinn Head.) But there are plenty of them about. Barra makes a good introduction to the main themes of the Outer Hebrides, as mentioned here, if heading northbound. And its Gaelic speaking community is strong and resourceful. Read about one of the other Western Isles, say: Eriskay or the Uists and Benbecula; or the top end of the islands: Lewis or Harris. The Isle of Eriskay is small and totally charming. It has classic Outer Hebridean dazzling colours of sand and sea when the sun shines. It also has a pub for when the sun doesn't shine, as well as a causeway connection to South Uist. It's a totally 'get-away' relaxing location. In the Uists and Benbecula there's a feeling of community and continuity. It's a hard landscape with long horizons and big skies and sometimes more water than land. There is also a strong sense of tradition. But are weird arty installations the best way of memorialising the past? Beaches like nowhere else in Scotland head the list of Harris features. And lunar landscapes, art galleries galore and great walking. Oh, and that tweed. The Isle of Lewis is the topmost part of the Outer Hebrides and has the largest town, Stornoway, and the famous Standing Stones of Calanais - and lots more.